Sunday was a shopping and walkabout day. Another warm beautiful yet a bit hazy Beijing morning greeted us as a few of us made the traditional trek to Jenny’s pearl shop in the Pearl Market. We took the subway this time. The damned cheap and extensive subway, that is. And no smog underground – unlike the last time I visited. Numerous other missions have done the heavy lifting and found a shop whose prices are reasonable and haggling is not really necessary. The good thing is that you know you are getting quality. The bad thing is that well, I guess there isn’t really anything bad. Unless you count how hot the shop can be due to the lighting. But jenny gives out free bottles of water, so it was all good. I bought a selection of earrings, pendants and necklaces all for under $150 – total. He looks happy, doesn’t he? 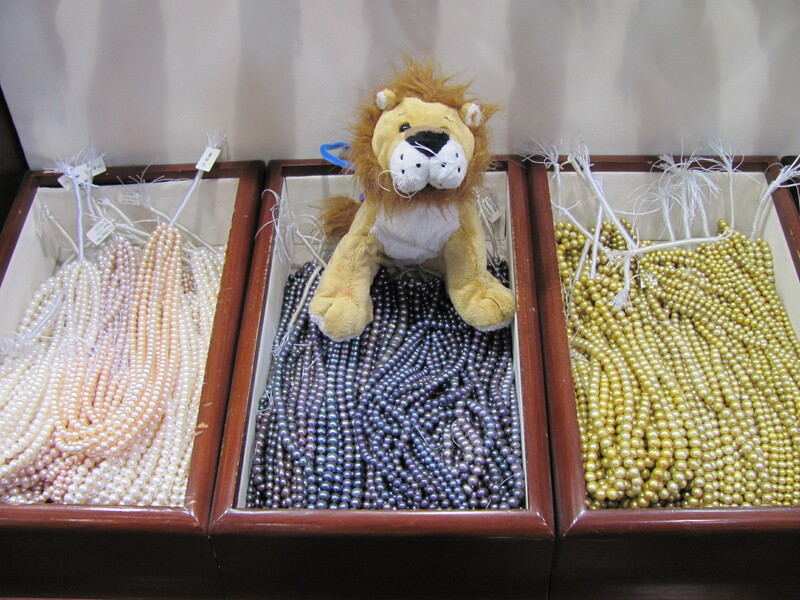 Yes, those ARE all real pearls. And those three drawers represent only a small portion of what one sees at Jenny’s. And hers is only one of scores of pearl shops. There are at least a dozen of them on the top floor of the Market… and the rule about these markets is that the higher the floor, the better the quality. 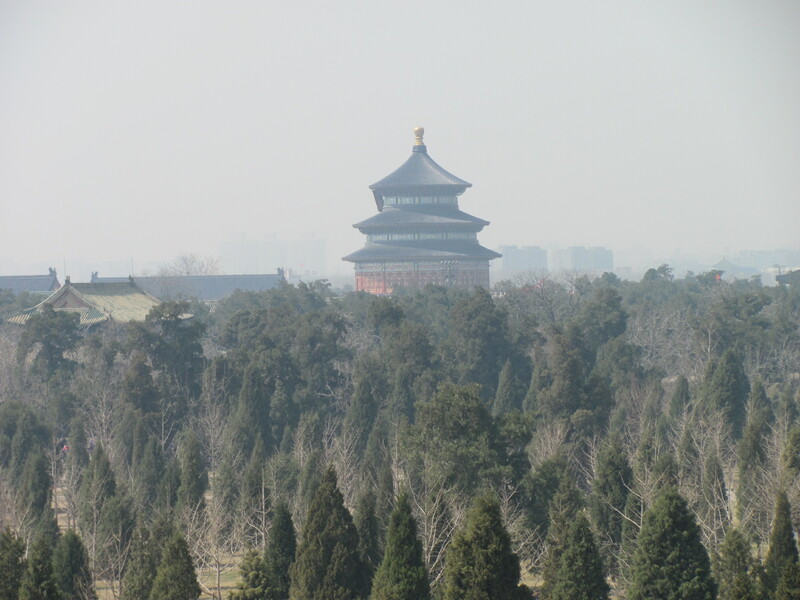 Even better, there is a balcony off the top floor where, looking out over the street, you can see the Temple of Heaven in the distance. Unfortunately, what was a very good day didn’t end well. A group of use had dinner at an Indian spot not too far from the hotel. It was pretty good at first, but at about midnight, my stomach rebelled and the rest of my night was not well spent. Somehow, I managed to make it out of bed, to the meetings and remained coherent enough to lead much of the discussions for the workday on Monday. Feeling much better now however, after a nice blandish dinner of noodles and dumplings. Here’s a neat tidbit. Something I hadn’t noticed on the last trip was the Chinese, and apparently Asian penchant for drinking hot water. One of my colleagues who has lived in China said that the roots for this likely lie in the fact that boiling water kills disease-causing bacteria. Makes sense to me. I guess there may be a lot fewer than 1.6 billion Chinese if much of the population had been drinking contaminated all these years. I have seen elsewhere that hot drinks after a meal will also prevent oily foods from clotting and hindering digestion. Who knows? Oh, and I still have yet to see a firetruck in this city. They don’t have uncontrolled fires here? Tomorrow is our last full day in Beijing as we leave for the airport at 1:30 on Wednesday.